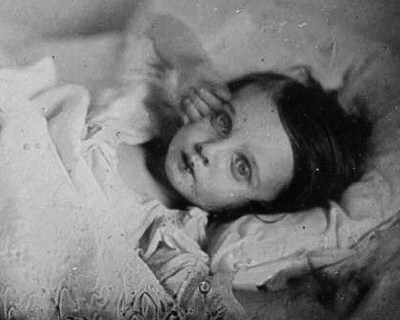 Post-mortem photography began in the 19th century, essentially beginning with the invention of the camera, and ended in the 1940s. It was most popular in Britain and America, but it did spread to Eastern Europe by the 1920s. 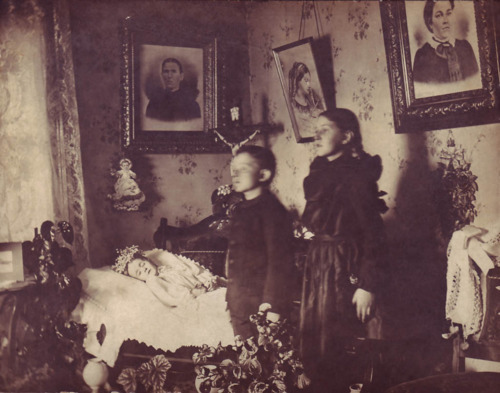 In a broad sense, it is defined as the act of photographing a deceased person. However, in the Victorian age, it became a fine art that may seem a bit macabre to modern sensibilities. 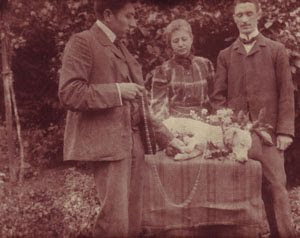 It was popular to prop the deceased into a position so as to appear alive with the surviving family or friends posing with them in a sort of family photo. The purpose of this was not to be sensational or macabre, but to have something beautiful to remember your lost loved one by. In the context of the mid-19th century, cameras were new technology and photography a brand new art form and was not as easily available to the public as it is today. That is why they posed the dead to appear, at least in the photo, as if they were still alive. In many cases, these photo shoots would be the only photos ever taken of the deceased and only the rich could afford to have a portrait painted. Photos in general were still not cheap but were affordable to the average person. Also, the time it took to take a photo was considerably longer in the early days of the camera, but they were considerably quicker compared to the time it would take a commissioned painter to create a portrait. 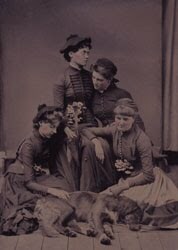 Despite the differences between painted portraits, photographs were still taken more seriously then than they are now. You couldn’t just “snap a pic” on your cell phone anytime the mood struck; rather one would have to find a professional photographer and then sit in the pose for five or more minutes without moving. Slight movements would cause blurriness in the photo. You may notice a difference in clarity between the deceased and the rest of the family because of the ever so slight movements of the living compared to the perfect stillness of the dead. Below I have included two examples of this. A skilled photographer could alter the photo to make the deceased’s eyes appear to be open. Usually, the photographer would color in the pupil and occasionally the outline of the eye to achieve this effect. These photos are so lifelike that it is sometimes difficult to be sure who the deceased is in a group picture! 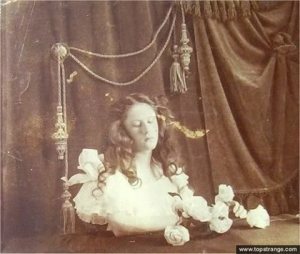 I have heard that the eyes could be held open if the eyes were still intact at the time of the photo session, but to my knowledge I have not seen any examples of this and I have to question the actual logistics of doing so. The picture below is a prime example of a colored in photograph. The earlier photos never show the coffin or any funerary fixtures. However, babies seem to be an exception; they were sometimes shown in or next to their coffins. 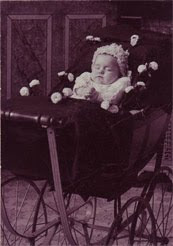 I noticed that infants were more often depicted lying in their strollers in American photos. Children were also frequently shown with their toys. One will find that photos of children and babies appear in these photos more often than adults. This is due to much higher childhood mortality rates. It is also quite interesting to note that the practice even extended to the family pet. I assume that it was only the very wealthy who would have come up with the money for it, but below you can see a few examples of this. 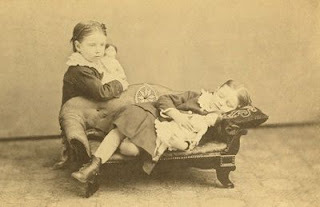 The elaborate post-mortem photography shown above survived until the end of the Victorian era. However, in the early 1900s it slowly became common to take the photo with the deceased in their coffin or in their “death bed.” This type of photograph is less jarring, at least to me, since it is more similar to the funeral service we still practice today. This type of post-mortem photography survived into the 1940s before the practice faded away. Modern reactions to this practice are generally negative. I find this interesting since it is not uncommon to see death scene photos of dead celebrities, or even depictions of violent deaths such as suicides and accidents. Even autopsy photos are readily available and are generally sought after when a celebrity meets their end. 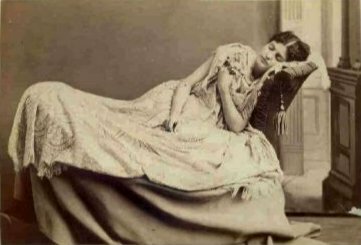 This in contrast to the purpose of the post-mortem photography of the Victorian era illustrates the differences in cultures from then to now. I can’t help but feel that there is much more respect shown for the dead in this old practice. The average person has no concept of what happens to the body when it is prepared for the viewing. Embalming is only the beginning; the loved one is essentially prepped like a turkey in ways that I will not detail. There is no need for the actual post-mortem photographs anymore, since we now have easy access to photos of our loved ones while alive. However, the care and personal nature of the process and customs back then are so very different than now. Death is a taboo in modern culture; we essentially avoid it at all costs and do not even so much as speak about. I observed at the recent funeral of my grandmother that during the viewing everyone spoke about everything except the reason why we were all there. If not for the open casket, one would have thought it a cocktail party instead of a funeral. Why are we so distant now from the reality of death? The genuine emotion captured for all time in these photographs speaks volumes. The photo below is of a man and his recently deceased wife. Is it so awful that he didn’t shudder away from her and pretend nothing had happened? Over one hundred years have passed and we can still feel that man’s pain and love. Having worked in and out of a mortuary over 5 years not too disturbing or macabre to see these photo's. What is of greater interest is, as you state, the taboo of discussion upon death(perhaps due to lack of religious belief in the 20th c) and why you chose to draw attention to these photo's other than their photographic and sociological significance. It's just "photos" not "photo's." 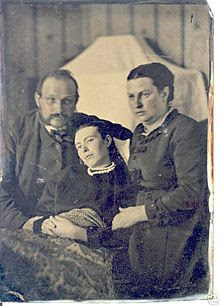 So, Im really interested in post mortem photography. I'm currently working in a museum, and today I came across a tin type that Im relatively certain is a posthumous photograph. After examining that photo, and consulting my wife as well as a friend of mine studying mortuary science, we all three independently came to the same conclusion that it is definitely a post-mortem photograph. As you point out, the hands are stiff and the left arm seems to be propped up (the mortified child is likely obscuring a post holding the arm up) and the eyes of the mother look to be painted on. Her overall posture is off; she seems to be imitating a natural movement but a little too awkwardly--reminiscent of a mannequin. Also, notice that the child’s face is much more faded and blurrier than the crisp lines of the mothers’ face. The hair may be a wig, something is just wrong with the way it is sitting. Thanks for sharing it; that is a very unique and bizarre photo either way. I have yet another postmortem image question that I've been sending around, your insight was great last time, so I thought I'd send it your way! 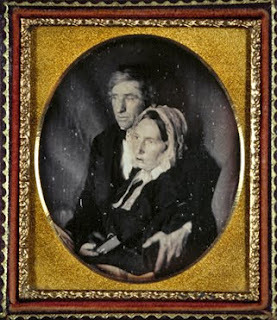 Just yesterday, I purchased a really great daguerreotype from a local antiques shop, and I have the suspicion that it might be postmortem, but Im actually quite stumped by it. It would be great if you could take a look and let me know what you think! Thanks! Just thought I'd share this image, its an interesting piece, dead or not! I've just found your page and link, while looking at another page. I've always found this to be interesting. A lot of people would see it as morbid and bizarre, by which I can understand why they would think that. It brings to my mind 'Books of Dead' which were photo albums of the deceased. Are these 'books' apart of the daguerreotype of photography that you're talking about here? King Midas and An Alchemical Touch?